It is with great sadness that I write of the passing of our dear friend, Patrick Duff. While walking their dog Sheila on November 5th near their home, a tree was struck by lightning and large branch hit Patrick and his wife Suzy. While Suzy sustained minor injuries, at that point we lost a very good friend to Sound RIDER! Patrick outside of Vista House during the Anti 5 Poker Run of 2006. It was so hot we were wearing evaporative cooling vests. DO NOT attempt to reproduce them. I hired Patrick to work with Sound RIDER! back in 2006. He was instrumental in the creation of the Packing Light/Packing Right book, doing much of the initial editing and almost all of the product photography and photo post production. At the same time he assisted in more than doubling the offerings in the online store writing much of the copy and uploading text and photos. He was a great spokesman for the products and fully understood the mission of Sound RIDER! In true Packing Light/Packing Right form. Patrick doing laundry during the Rally in the Gorge. Patrick also became an integral part of a number of Sound RIDER! events including The Rally in the Gorge, The Anti-5, the first Sasquatch Poker Run and the 3 Pass BLA$T. We created more than a dozen routes and maps that summer and rode a lot of miles together. In 2007 Patrick went to work for a small book publishing company on Bainbridge Island and married his sweetheart, Suzy. They bought a home in Shoreline and befriended a sweet Australian Shepherd, Sheila. Connie and I stayed good friends with Patrick and Suzy doing outdoor adventures now and then that included hiking and kayaking. 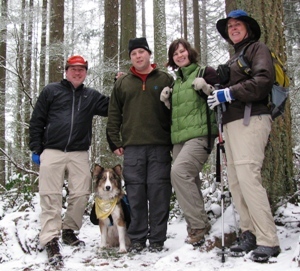 hiking on a snowy day in the Issaquah Alps, 2009. L-R: Tom, Sheila, Patrick, Suzy & Connie. That year Patrick purchased a Yamaha Majesty scooter and became a regular attendee with our Northwest Scooter Enthusiasts group. He joined us on many rides to places like Mt. Baker, the Ginkgo Petrified Forest and Whidbey Island to name just a few. This year we invented the Tuesday Night Camera Club, a good excuse to go have social time together and hone our photography skills. We'd meet and share several of our own recent pictures with each other, as well as a few others that we'd admired from other shooters. The conversation would ensue and before you knew it we were both making better photos. We'd talk about light, depth perception and placement and challenge each other with assignments. One night he challenged me to shoot 100% manual mode for the next month. Not easy to do when it's so easy to go auto in the digital age. I countered putting him up to the challenge of working on flash fill techniques. 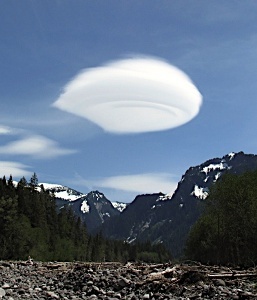 Patrick snagged this stunning photograph of a lenticular cloud during a hike in the Cascades and shared it with me at the Tuesday Night Camera Club. Although Patrick never worked fulltime for Sound RIDER! again, he routinely helped out doing sales at the Seattle Motorcycle Show and we were thrilled to have him back working with us at the Rally in the Gorge this summer. As Connie says � 'he totally saved me' when she had to check into a motel for three days with sun stroke during the rally. Patrick and Stacey Swanson manned the registration desk and store sales throughout Connie's absence. He was a loyal, dedicated individual that we could always count on here at Sound RIDER! He was a good friend to Connie and me, and we are all indebted to his goodness. We will miss him greatly. "Well you see Tom, this just goes to show you, if you wear your gear and keep your riding skills sharp, you're probably more likely to get struck by a falling branch in a lightening storm, than check out on a bike." We'll keep our chins up in this sad time; we know Patrick would want it that way.